Khan’s record improved to 31-3 as a pro. Amir Khan, the British-Pakistani Muslim welterweight contender, cleared what may be the final hurdle between himself and a big-money championship fight against Floyd Mayweather Jr.
On Friday night at the Barclays Center in Brooklyn, N.Y., Khan defeated Chris Algieri by unanimous decision (117-111, 115-113, 117-111) to retain his WBC Silver welterweight title. The bout was seen as an audition of sorts for Khan, who is one of a handful of potential opponents for what might be the last match of Mayweather’s Hall of Fame career. Mayweather, undefeated at 48-0, holds the WBC, WBA and WBO welterweight titles and is widely considered the No. 1 pound-for-pound boxer in the sport. Khan improved his professional record to 31-3 with 19 knockouts by beating Algieri (20-2, 8 KOs), a former pro kickboxer who burst onto boxing’s main-event scene last year with an upset win over Ruslan Provodnikov, followed up by a blowout loss to Manny Pacquiao. 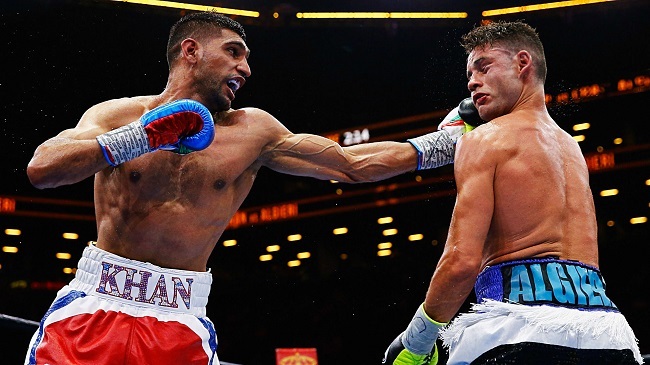 Algieri is known as a slick defensive fighter, but he couldn’t keep up with Khan’s fast feet and quick hands. In a very Mayweather-like effort, Khan took a few early shots from Algieri before dominating the second half of the 12-round fight. Khan was in the mix for a possible fight with Mayweather last year, but Mayweather’s insistence on a mid-September date conflicted with Khan’s religious commitments. The Islamic holy month of Ramadan ended in late-July last year, and Khan didn’t believe he could be physically ready to fight given the quick turnaround after fasting for a month. With Ramadan ending a bit earlier on the calendar this year, Khan has said he would now be willing to fight Mayweather in September.